Fans of Lissie and Brandi Carlile may have a new favorite. 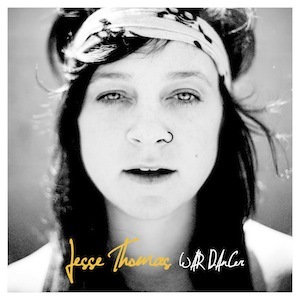 Jesse Thomas releases War Parade on Valentine’s Day this year, which is a bit ironic considering most of her songs wreak of bitterness in losing love, a longing to find love, and considering love a complete waste of time. But Thomas isn’t all about complaining. Back in 2008, the Kentucky native packed up and headed out west to Los Angeles. After a series of open mics and getting networked, she was approached by Jim Roach of Red Parade Music group because he heard something special. At times, it sounds as if Thomas is singing out of one side of her mouth and smoking a cigarette out of the other. The raspy voice bleeds folk and country roots, which in turn makes it completely understandable that big named artists like John Mayer and The Cary Brothers would give her a call to open up their shows. Jesse currently has no future plans for a tour, but we’re sure that will change when music fans everywhere discover her beautiful songs.